The Republic o Kalmykie (Roushie: Респу́блика Калмы́кия, Respublika Kalmykiya; Modren Oirat: Хальмг Таңһч, Hal'mg Tanghch) is a federal subject o Roushie (a republic). Population: 289,481 (2010 Census). It is the anerlie Buddhist region in Europe. It haes an aw become well kent as an internaitional chess mecca acause its umwhile Preses, Kirsan Ilyumzhinov, is the heid o the Internaitional Chess Federation (FIDE). 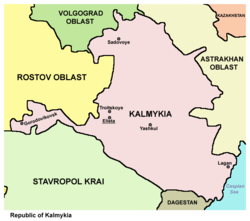 Kalmykia is traversed bi the northeasterly line o equal latitude an langitude. 5 апреля 1994 г. «Степное Уложение (Конституция) Республики Калмыкия», в ред. Закона №386-III-З от 20 декабря 2007 г. (April 5, 1994 Steppe Code (Constitution) of the Republic of Kalmykia, as amended by the Law #386-III-Z of December 20, 2007. ). Wikimedia Commons haes media relatit tae Kalmykia.